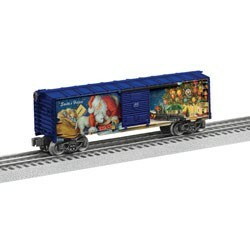 Our favorite artist is back with this beautiful Christmas boxcar for your layout this year. Made of US and imported parts, this Angela Trotta Thomas boxcar will make your set pop! Made in USA of U.S. and Imported Parts Die-cast metal sprung trucks and operating couplers Opening doors on boxcars Metal frame and brake wheel on boxcars Metal handrails, platform, and ladders on tank cars PRODUCT SPECIFICATIONS Gauge: Traditional O Gauge Scale Type: Semi-Scale Min Curve: O27 Dimensions: 10 1/2"